UNITED NATIONS, January 19 -- When the bloodbath in Pibor in South Sudan began, local people blamed the UN for not arriving fast enough, and not taking action to try to stop the attackers. 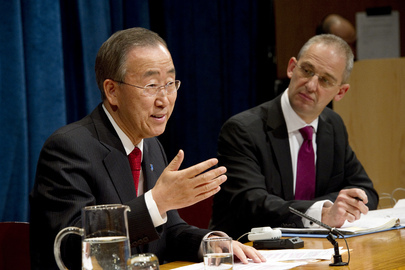 On January 18, Secretary General Ban Ki-moon said, "at the critical moment, I was reduced to begging for replacements from neighboring countries and missions. With limited resources, we tried our best." Is this a rare candid statement, or a passing of the buck? After asking questions and writing about the UN's slow response in Pibor as early as January 2, Inner City Press on January 11 reported that the UN had known since mid November that the Russian helicopters would not fly anymore in South Sudan. Immediately UN officials pushed back, saying that it is customary for helicopters to fly for the UN even after the UN has, as here, allowed the Letter of Assist to expire. But the UN had been told that the Russian helicopters would not fly. Inner City Press repeated asked Ban's Office of the Spokesperson about this; lead spokesman Martin Nesirky claimed that the UN would not be discussing its negotiations about helicopters. The representative of another large troop contributing country told Inner City Press that under Ban, and his Department of Field Support, paperwork has gotten "sloppy," and the Secretariat has tried to play one member state off against another. "They are just using the UN as a platform, a launching pad," the representative told Inner City Press. As Inner City Press quoted in its January 11 story, "Maybe when asked to come and help civilians, [the Russians] should have," one Security Council member told Inner City Press. "But they weren't required to and it's [the UN's] fault that they didn't have an agreement with the Russians. Now they're trying to blame it on them." Click here for Ban's January 18 "Responsibility to Protect" speech. In a January 16 interview with Inner City Press, DFS Under Secretary General Susana Malcorra said on the record that she and Secretary General Ban Ki-moon had contacted the Russians over Christmas about the issue. Malcorra described belated moves to get Bangladeshi helicopters from the UN Mission in the Congo, and Ethiopian helicopters from Abyei in north Sudan. As Inner City Press put it to her, this seems akin to a City fire commissioner, knowing for six weeks that the city does not have fire truck protection, belatedly casting all blame elsewhere when the fire occurs, and he belatedly contracts for other trucks. Click here for the interview. It remains unanswered: if the UN could get alternate helicopters now, after the bloodbath, why wasn't this possible before, in order to stop the bloodshed? Inner City Press has asked. Rather than answer, the Secretariat has written, and Ban delivered, a speech entirely passing the buck. This is why this UN does not improve. Watch this site.